The California-based band started in 2016 and released a single and a demo in 2017, now they present the 7" Faster Than Fire via Shadow Kingdom Records. Singer and rhthym guitarist Matt Harvey might be known for his work with Exhumed and Gruesome, while lead guitarist Tom Draper is known for his time with Angel Witch. The trio is completed by bassist Alejandro Corredor - drums were recorded by session drummer Carlos Donegean. The title track Faster Than Fire is an up-tempo rocker in the vain of NWoBHM bands with a sing-along chorus. The sound is raw and gives the song an authentic 80's feeling, but with a clean guitar sounds, so that no detail get lost. At The Last Stand you get another up-tempo track with twin guitar passages, and with Come Alive they show a different side of Pounder. This is a classic heavy rocker in the vain of Dio. While Matt Harvey's voice is strong on the up-tempo rockers, he can't shine at this one. The vinyl 7" is just an appetizer for their upcoming debut album Uncivilized. The info sheet is listing a cover version of Angel Witch, but didn't name the song and as it's not at the promo copy, I can't give any more details. 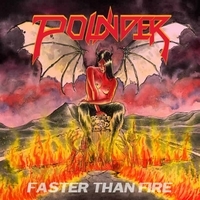 Anyway, fans of 80's heavy metal who want some new tracks should check out Pounder!